Hours after the release of a purported video clip by an online newspaper, Daily Nigerian, showing the governor of Kano State, Abdullahi Umar Ganduje, allegedly collecting bribes in hard currency, the state government has dismissed the footage and vowed to sue the publisher. The state government described the allegation as defamation of character, stressing that video was cloned and doctored. This was contained in a statement by the state Commissioner of Information, Youth and Culture, Comrade Muhammad Garba issued to journalists yesterday. The government stated that the allegation indicates the extent to which mischievous elements can go to discredit public figures by wielding non-existent scandals against them. The state also emphasized that a mere observation of the cloned video clearly showed that the video was doctored and disjointed with no material facts or evidence to prove the allegations, describing it as a callous attempt to tarnish the hard earned image of the office and the person of the Governor. 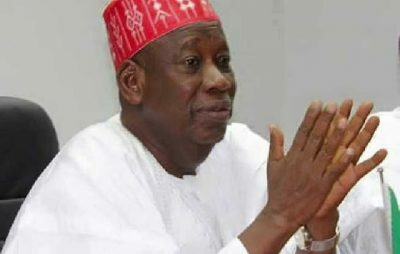 “Kano state government has decided to file a criminal case against an online publication, Daily Nigerian, and its publisher on defamation of character after it released a clone and doctored video footage mischievously portraying Governor Abdullahi Umar Ganduje involved in an inappropriate conduct. It would be recalled that the publisher of Daily Nigerian newspaper, Ja’afar Ja’afar, last week reported that a North-West governor was caught on camera receiving bribes amounting to $5 million. In a subsequent report, Ja’afar mentioned the identity of the governor as Ganduje, while releasing the purported video footage yesterday and vowed to release more.